My Current Impression on Loving, Never Forgetting! Yes... be ready to cry buckets of tears! I've watched "Loving Never Forgetting" now it's time to give my thoughts on the matter. The drama feels like a modernized Qiong Yao drama... Jerry Yan being a more modern version of senior actor Qin Han. So what are my thoughts? At first, it seems to be just an Autumn Concerto remake but this time, I always have the feeling I want to tear my heart out. Autumn Concerto felt like a Qiong Yao drama but this one wanted to make me tear my heart out. It almost feels typical to Qiong Yao's dramas... family conflict, love polygons and buckets of tears. 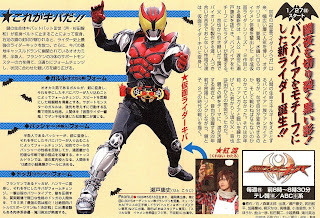 Kamen Rider Kiva: A Danny Phantom-ish Kamen Rider Season! Kamen Rider Kiva may be a mess (for some) but I still have a soft spot for it. Maybe I've had enough of too much dark and edgy. Also, it's for me more rewatchable than the super depressing season that is Kamen Rider Faiz. Moving on... why do I think Kamen Rider Kiva is a Danny Phantom-ish season? While it has horror elements but it's hardly horror but a parody of past successes. Nothing in the show really scares anyone maybe except when Fangires leap into action. But other than that, the way humans die from Fangire attacks here is very, VERY cartoony. They turn into glass and break. The whole premise of the show feels more like a Nicktoon for teenagers than the horror Kamen Rider has. Hey I'm not complaining, I kinda like having cartoony seasons too! Jerry Yan and Esther Liu: Possible Qin Han x Liu Xue Hua Type Chemistry?! After seeing Jerry Yan's post-Meteor Garden projects and Esther Liu's more serious roles, I think it might be nice to pair Jerry Yan and Esther Liu for at least one remake of Qin Han's old drama projects. Liu Yifei might be more of a contemporary Brigitte Lin, Esther Liu feels more like Liu Xuehua after Barbie Xu is no longer available. So what makes Esther Liu more of a contemporary Liu Xuehua is because she's more involved with dramas over movies. Liu Yifei feels more like Brigitte Lin, Esther Liu feels more like she could be Liu Xuehua. Having watching "Green Forest, My Home", I think Esther Liu would do well in playing Liu Xuehua's classic roles in Barbie Xu's place. She's impressed me at the same level of Barbie Xu IMO. She and Jerry Yan may have that kind of chemistry.